New Building for AJ Scott Construction Under way! The foundations are down and the panels are going up at Avenger Crescent. This building Architecturally and Structurally designed by Lewis and Barrow Ltd is taking form. THIS SUMMER is being forecast as one of our hottest. Having an unusually hot summer can have an effect on how comfortable our houses are over the summer period. deciduous planting to provide summer shading. creating taller internal spaces – provides more space at ceiling level for warmer air to accumulate but keeps it above occupants’ heads. The new completed complex (designed by David Hill from Wilson & Hill Architects and structurally engineered by Stephen Barrow of Lewis & Barrow - Consulting Engineers) once it is fully leased will have a value of around $14 million. Lewis and Barrow Ltd's long-time staff member Chris Gordon has been appointed as new Director along side existing Managing Director and Founder, Warren Lewis. The International Rental Car Precinct up and running. This is proving to be a valuable pick up / drop off point for tourists to Christchurch! The International Rental Car Precinct has been officially opened! On Monday 14th Warren Reedy and Warren Lewis from Lewis and Barrow attended the grand opening of this building. Colombo Street Panels erected and first floor ready to be poured! Lewis & Barrow provided structural design of repairs and carried out the site supervision of the lifting work on this Colombo Street building. Careful monitoring of the building during the lift ensured the building was brought back into level. Large steel beams provided the support and were then fixed in place. The International Rental Car Precinct located on the corner of Kilmore and Manchester Streets is nearing completion and tenants are starting to add their branding to the complex. The Architectural and Structural designs both completed by Lewis & Barrow Ltd.
Click the photo to read the story! Lewis & Barrow Ltd have provided the Structural design for the new banking and retail building at 664/668 Colombo Street. Structural supervision is currently being undertaken through the construction process. 246 High Street featured again this month in the Canterbury Build Magazine! Lewis & Barrow Ltd completed the Architectural and Structural Design. As you can see, things are steadily moving forward with the Christchurch International Rental Car Precinct! The exterior is taking shape and it's clear this building will become a new reference point for the corner of Manchester and Kilmore Streets. Christchurch's Central City is starting to see some volume added back to the streets with the new completed buildings. 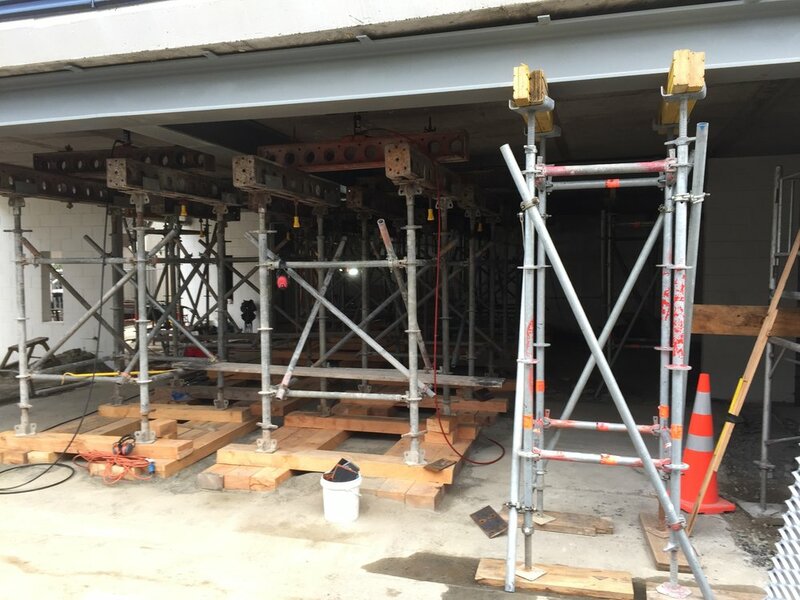 Making steady progress and taking an impressive form is the Christchurch International Rental Car Precinct. Due for completion mid-2017 this facility will provide visitors to Christchurch with a central city location for rental car hire or drop off. Located at the corner of Manchester and Kilmore Streets. Architectural and Structural Design was completed in-house by Lewis & Barrow Ltd.
246 High Street is featured in the April 2017 issue of Canterbury Build magazine. Click on the magazine cover to view the story! 246 High Street, Architecturally and Structurally designed by Lewis & Barrow Ltd is now complete. The first tenant on the top floor is now occupying the space and the ground floor retail fit out is going ahead. We look forward to seeing the exciting new retail tenant in place. This area of the retail precinct is now largely complete with more buildings in the area due for completion in 2017 this evolving area will be a dynamic and eye-catching space.